Paul Cooke says his hurt over Doncaster RLFC’s winless season led to his departure as the club’s head coach. Cooke left the Dons yesterday by mutual consent with the club sitting six points adrift at the bottom of the Championship after losing all their 13 league games so far this season. 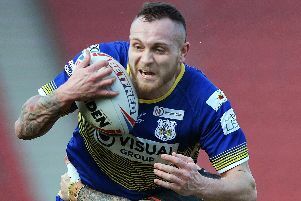 And the former Super League star – who tentatively retired from playing earlier this season – spoke of his sadness at the state of the Dons’ campaign. He said: “I’d like to say I feel deeply saddened and apologetic to everyone at the Dons, especially the fans for the 2015 season. “I’m certainly hurt by the club’s 2015 so far. “I know everyone works extremely hard in their department to achieve the clubs ambitions and ultimate goals. Cooke returned to rugby league with the Dons in 2012 after more than a year out of the game due to personal issues. He went on to play a vital role as a talismanic half back for the next three seasons, beginning with the Championship One title win and play-off double in 2012 before succeeding Tony Miller as head coach last season. In his first season as head coach, Cooke was named the Championship coach of the year after guiding the Dons to fourth place. And he says he will never be able to repay the club for offering him a route back into the game. He said: “Having re-joined the game of rugby league in no small part to Carl Hall, Tony Miller, John Scarrow and Doncaster RLFC back in 2012 I feel I owe these people and the club in particular a debt of gratitude which can never be repaid. “It gave me a renewed lease of life, enjoyment after a very difficult period in my personal life.